Having never caught a bowfin, I jumped at the opportunity to go out for an evening. We left work shortly after 4 and made the trip up to the islands on Lake Champlain. After making a pit stop for a drink and worms, we arrived at our first location to find the parking lot vacant and the fish were rising. 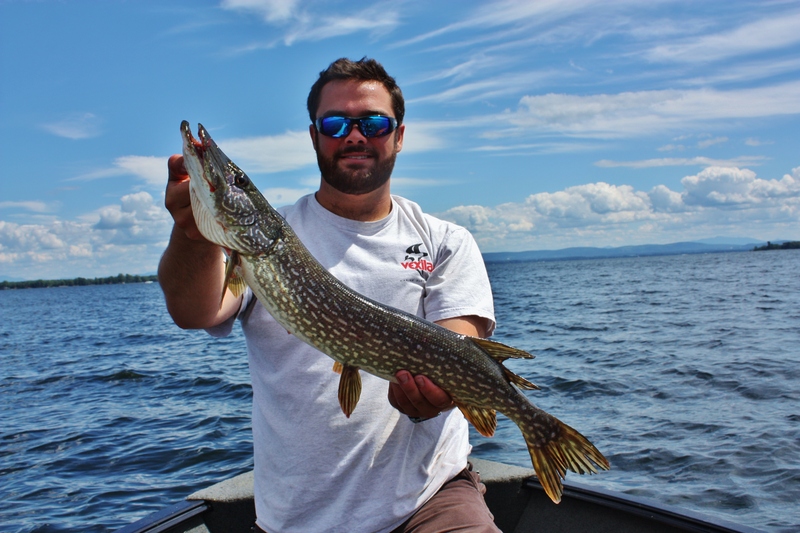 Having never fished the area (or species), I relied on my fishing partners experience in the area for what to do. The setup was simple. I ran a size 2 treble hook attached to a steel leader under a large round bobber. The depth the bobber was set at depended on how tall and thick the weed growth was. On average we ran about two feet of line under the bobber. 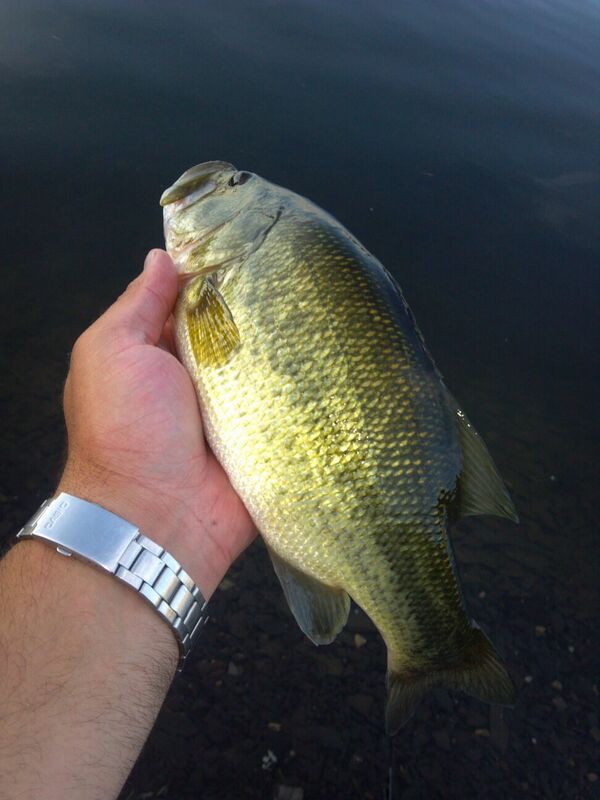 I was using my medium action 7′ St Croix Premier Series rod strung with 20 pound Power Pro Braided Line. I chose this rod mainly because of the line on the reel but also because it has a bit more backbone than the rest of my bass and panfish rods. 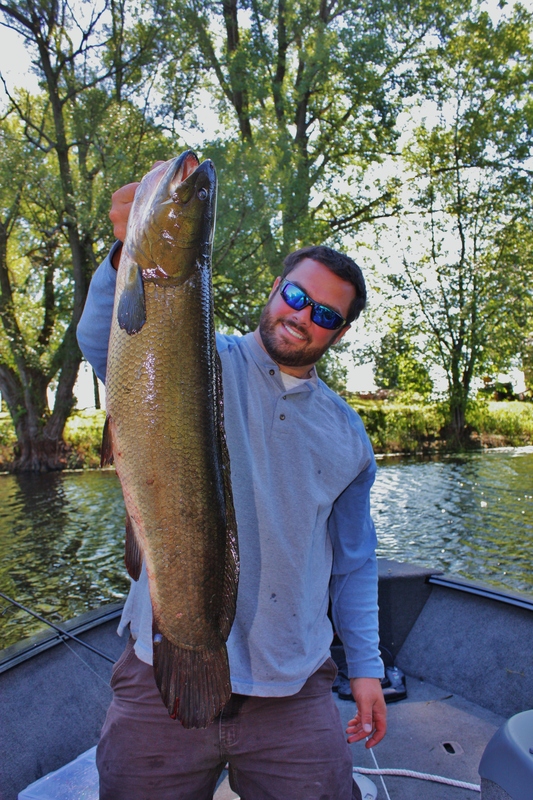 If I continue to fish for bowfin, I will look into a slightly heavier rod as well as a other hook options. The plan was to cast out some chicken fat to see if it perked any interest but fish for perch as back up. After a while of unsuccessful waiting, the fish continued to rise around us and frustration grew. 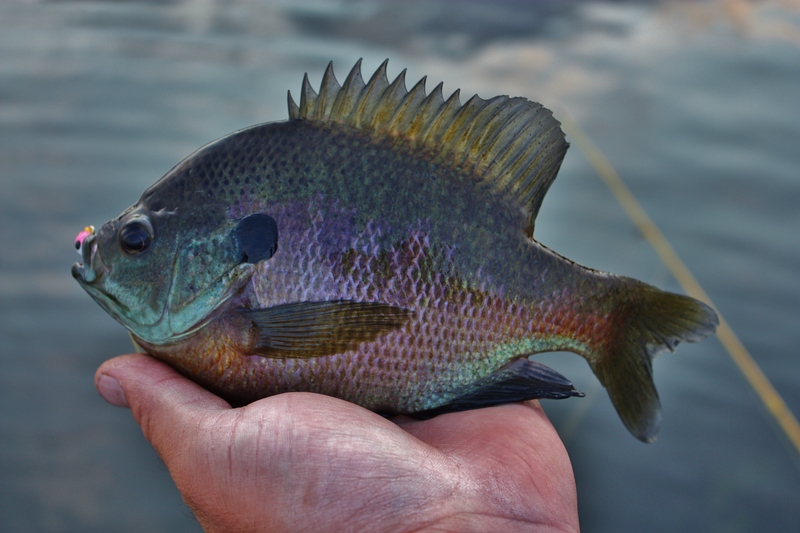 We kept trying for perch as it is one of the few legal baitfish that doesn’t need to be bought in the state. It wasn’t an issue catching fish but perch eluded us for much of the time. 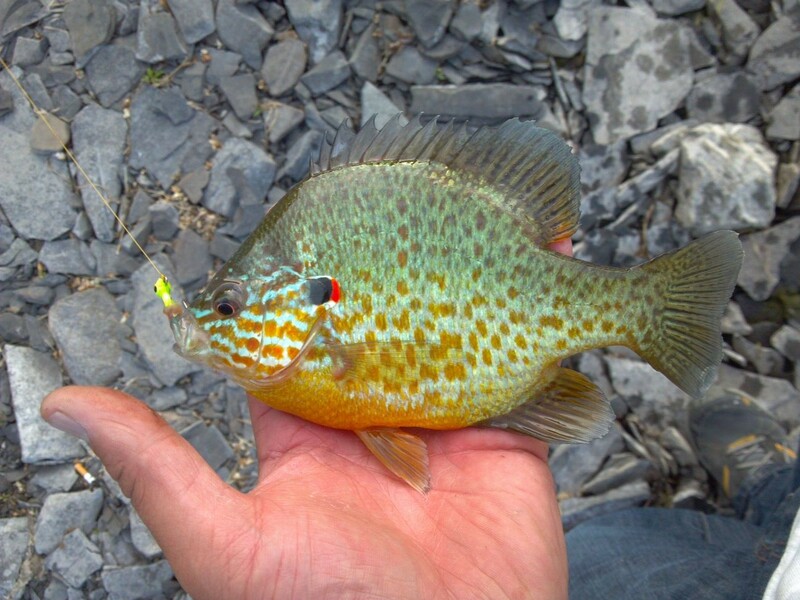 The rockbass and pumpkinseed were plenty hungry! Once we caught a perch, it was on. I hooked up within the first minute! 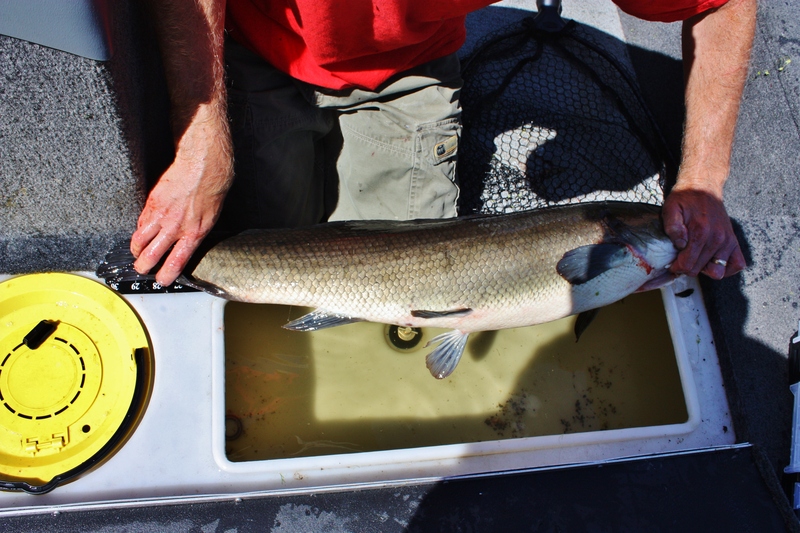 On the ride up, I was told that when a bowfin takes the bait, the first strike will pull the bobber under quickly but it will pop right back up. After the initial hit it will pause then start running. 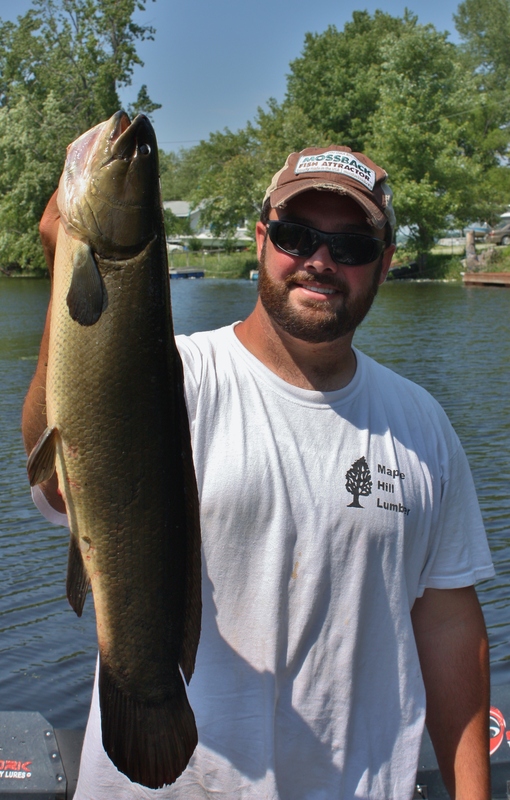 The x-factor in fishing for bowfin (at least for us) was knowing how long to wait before setting the hook. Being that wasn’t going to eat the fish and preferred not to risk killing it just to better my odds for a hook up, I set the hook somewhat quick. Many times this method didn’t work out so well. I would let the fish run a good 20 yards before setting it but I was still only able to land one fish. I was able to get two other fish right to shore before they turned and spit the hook as I was trying tucker them out. I think next time I would try a circle hook or even an Eagle Claw Alaskan Hooks to see if my hook up ratio would improve. 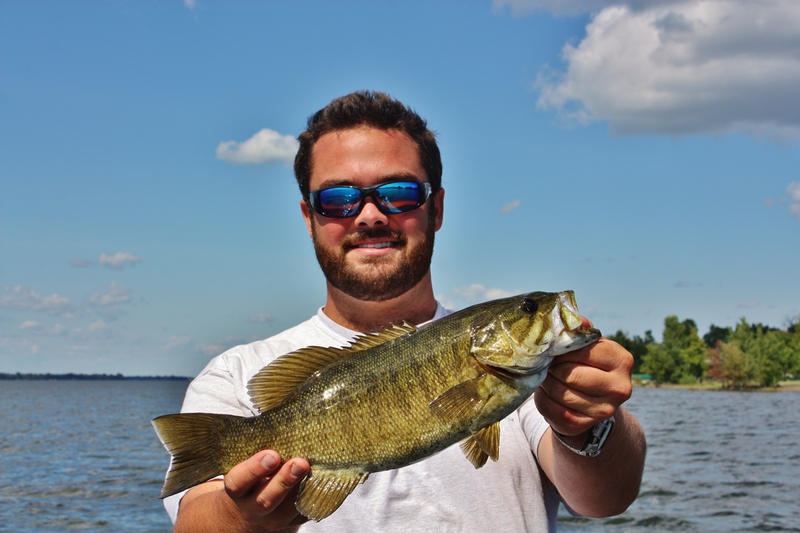 The fish I did land was 28″ and between 7.5 – 8 pounds. As I was standing on the shore with a perch head out, I looked down and had the fish I ended up catching slowing cruising by only a few feet away! I reeled in my line, pitched it a few feet over its head and it was on. My bobber popped, paused, then took off. I set the hook and a few minutes later as we were landing my fish my buddy’s bobber took off. 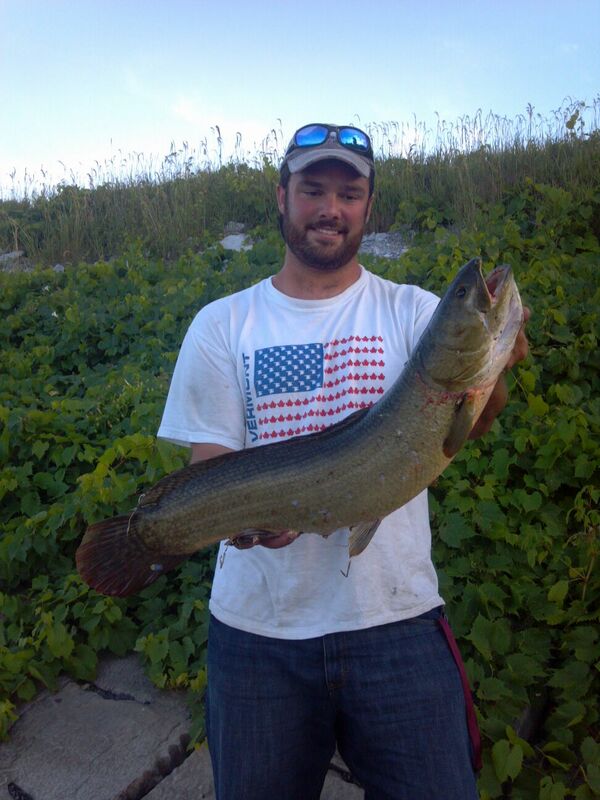 We ended up catching our only two bowfin of the night at the same time. 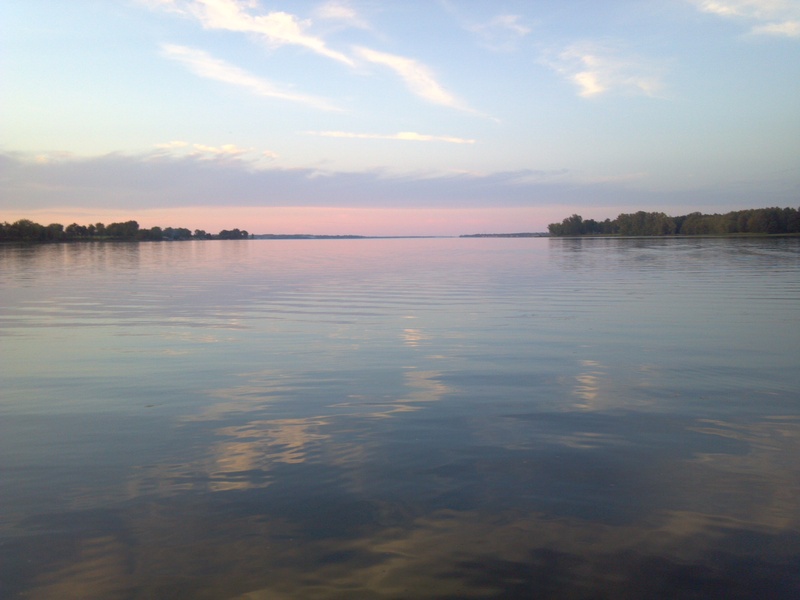 We could see the fish rising the majority of the time we were there but they slowed just before sunset. When we caught our fish it was right around 7 pm and the hour that followed would have been very successful if the hook sets we made had held. We had at least dozen decent opportunities over the course of about 3 hours as well as a few bites that were hit and runs.The fish that I hooked but wasn’t able to land were all battled for a few seconds before spitting the hook. I couldn’t figure out what I was doing wrong! It was a nice evening of fishing!